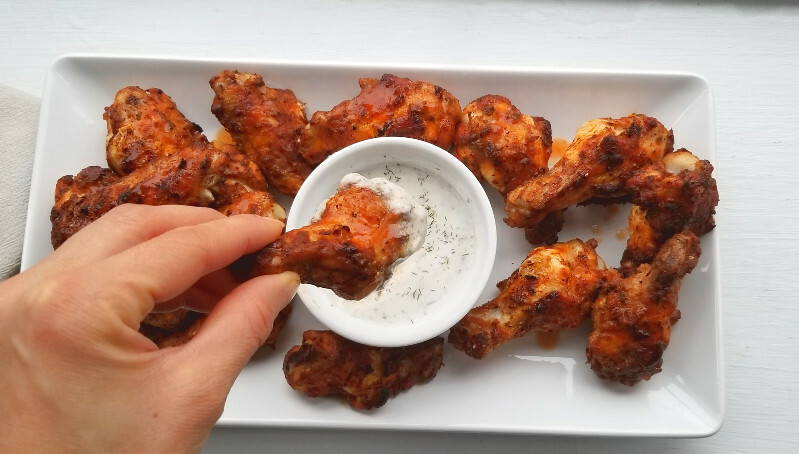 Party wings, hot wings, chicken wings, Super Bowl essentials…….Whatever you want to call them, these make the perfect party appetizer without any of the sugar and crap ingredients that come with store bought wings. I worked on this recipe for a party some clients of mine hosted, and I will definitely be making them next weekend for my husband’s birthday / Super Bowl extravaganza. A healthy, Whole30 and paleo friendly recipe for chicken wings that makes a great appetizer. Roast at 425 15-20 minutes until browned and reaches internal temperature of 165. *Note: all ovens cook at varying temperatures and intensities. My oven is convection and it cooks hotter and faster than many other ovens. 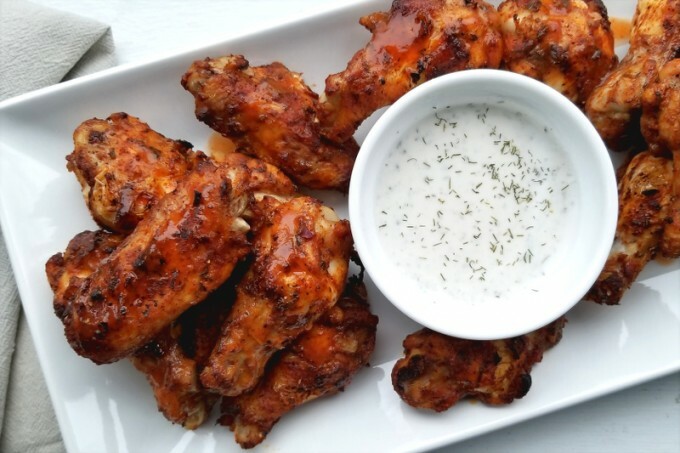 You may want to increase the cooking time if your oven tends to take longer to cook food or to brown the skin of chicken. Running a meal delivery business presents a welcome challenge for tasty, creative seafood dishes. This dairy free white fish chowder is flavorful yet mild and is really easy to whip up. 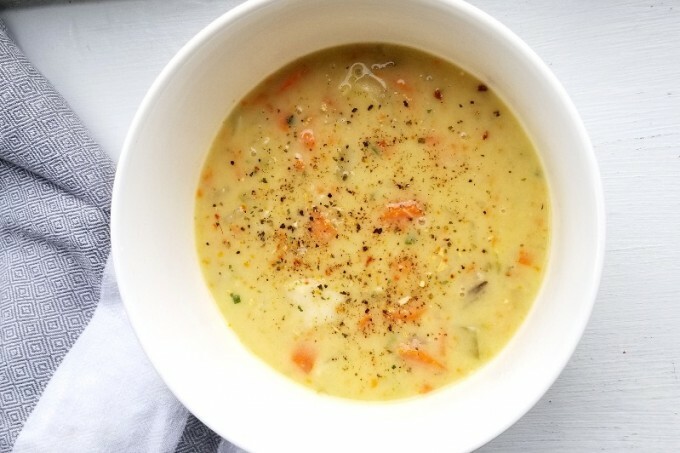 If you’re hesitant when it comes to seafood dishes, this is a really nice meal to try – trust me, I tested it on my husband and he is super picky about seafood. Hope you enjoy! A healthy, dairy free, paleo version of chowder that is mild and easy to make. Saute half the onion with oil for 5 minutes. Add half the potato, then add enough water just to cover the potatoes. Simmer until very soft, then puree with an immersion blender or in a blender then set aside. Saute remaining onion, celery, carrot, garlic in ghee/oil about 5 minutes. Add the remaining amount of potato, then the salt, and small amount water – just barely cover potatoes. Cover and gently simmer to soften the potatoes but don't overcook. When potatoes soft, add the pureed mixture back into pot, heat until warm over low heat. Add coconut milk and fish (over VERY LOW HEAT) – allow to heat just until fish is cooked, do not boil – only needs about 3 -4 mins. Fish is done when opaque. Taste for seasoning, salt as needed. Garnish with parsley. I don’t know why I am putting carrots in everything these days, but hey it’s been a great way to get extra veggies into my food. 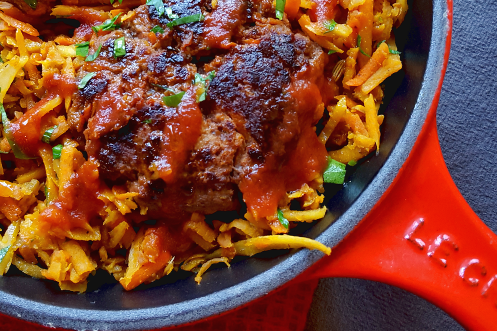 This recipe whips up quick and would make a perfect weeknight entree or a lunch the next day. 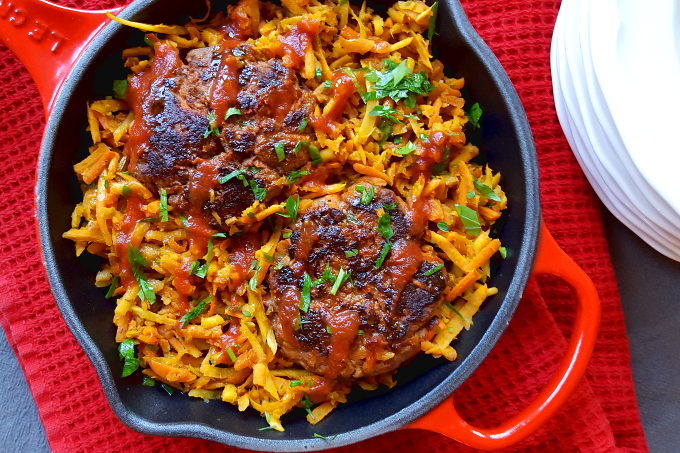 I served them over my Simple Sauteed Root Veggies , which you can cook in the pan right after you made your patties. I would suggest something else as well to serve alongside such as sautéed kale or a salad. A simple, quick and healthy dinner recipe that helps you get extra veggies on your plate. Combine all ingredients except oil/ghee in a bowl and mix until well combined. Heat a large skillet over medium heat, add coconut oil or ghee and swirl to coat pan. Place patties in pan and sear until well browned, about 5 -7 minutes. Reduce heat if they seem to be getting too dark, especially because the carrots in the mixture will burn if the pan is too hot. Flip patties and sear another 5 minutes, then reduce heat to low and finish cooking until centers are no longer pink and internal temperature reaches 165. Remove patties from pan- now would be the time to saute your root veggies right in the pan you just used. The brown bits leftover from the patties add great flavor. 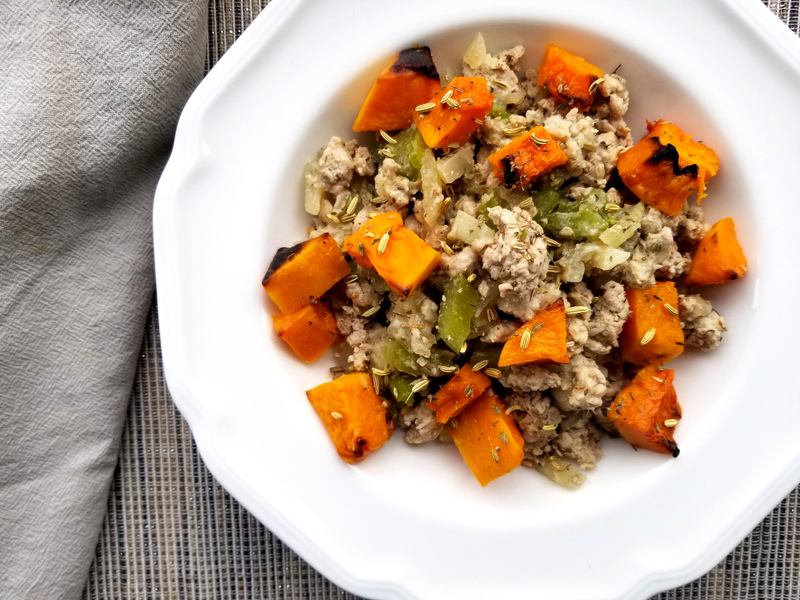 This is a great recipe for using up leftovers! 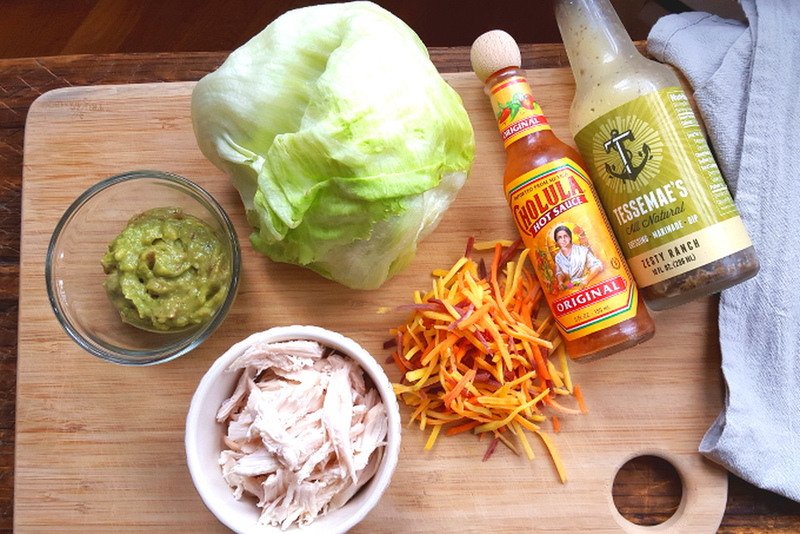 I had some roasted chicken from the other night and these lettuce wraps were a perfect way to use it up. You can get creative with the filling and basically use whatever you want. I think this recipe is really meant to serve as an example of a fun way to spruce up leftovers for lunch the next day: there’s no need for exact measurements- just assemble with what you have! 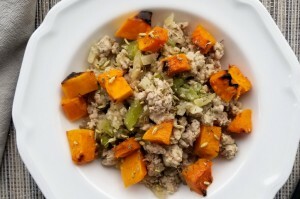 Simple, healthy and tasty way to use up leftovers! Trim the bottom off the iceberg lettuce so that you can pull the whole leaves off easily. Toss the chicken and veggies in a bowl with your desired sauce, plus some salt. You can add a little EVOO as well if you want and a squeeze of lemon. Add about ¼ - ⅓ cup of filling. If the leaf is too full the filling will spill out. Now, fold the leaf up like a burrito- roll and tuck the edges in. I made 4 rolls for myself for lunch. I’ve had this type of salad on my mind for a while, but a few variations of it didn’t quite hit the spot….. But today I made this on a whim without overthinking it and it came out pretty decent so I decided to share it. It could use more tweaking, but it’s such a simple recipe, ya’ll could mess with it as you please! It’s a great lunch salad that you could build off of- for example, top with some shredded chicken or flaked wild salmon, then add some arugula, maybe sprinkle some toasted sunflower seeds overtop for a little crunch. The tricky thing with kelp noodles in this dish is saving it overnight- I did some experimenting with a friend on this dish and it isn’t really a salad to store for a few days- it’s best made and then served within an hour or so. Soooo, obviously from the perspective of a personal chef, you want food that will hold well, so it’s back to the lab to figure out another version. In the meantime, enjoy this healthy salad on a hot summer day! The key to this recipe is all about the avocado. But then again, when is it not all about the avocado? 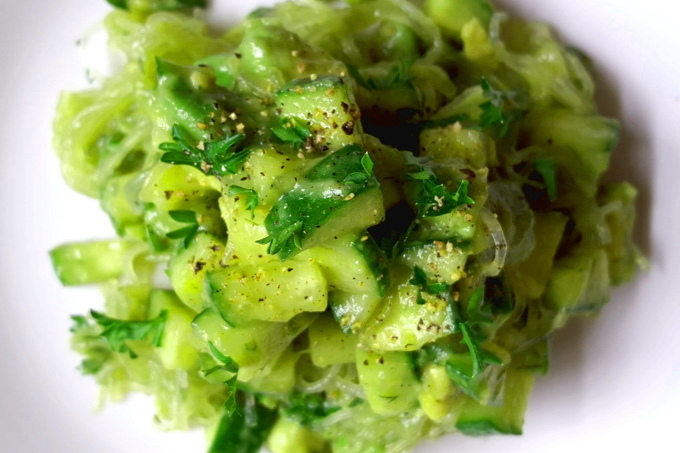 Simple, healthy summer salad recipe using kelp noodles to keep this dish gluten-free, grain-free and dairy-free. Dice cucumber into ½ inch pieces and place in medium mixing bowl. Add citrus zest, juice, olive oil, coconut aminos and salt, toss to combine. Cut avocado into 1 inch pieces and add to bowl along with herbs and noodles. Gently toss the salad until noodles are coated in dressing and the avocado has softened a little but hasn't turned into mush. Adjust seasoning to taste: you may want more citrus, more salt or more of everything! Allow salad to marinate in fridge for at least 15 minutes before serving. I whipped this salad up in less than 10 minutes right before serving it to one of my personal chef clients. It’s bright, refreshing and goes great with almost any entree. I can picture this dish being a lovely addition to a summer al fresco dinner gathering or a daytime barbecue. You could also add cherry tomatoes for a punch of color, or feel free to get creative with adding other veggies. This is one of those simple salads that can serve as a base for you to build a whole meal off of, just add a protein of choice and you’re good to go. Hope you enjoy! Refreshing, simple, easy, recipe that is great for al fresco dining! You can whip this together in 10 minutes right before serving. 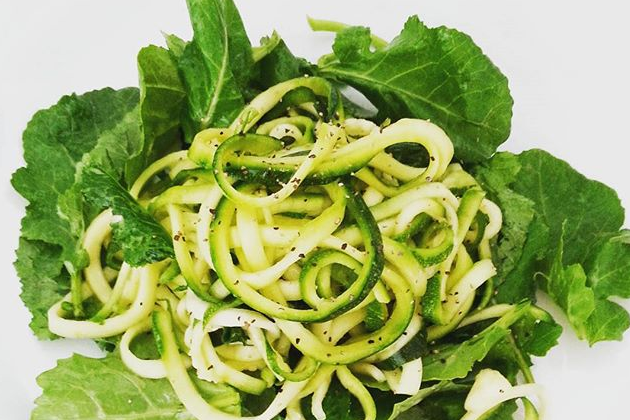 Spiralize your zucchini into noodles and place into a colander. Sprinkle the ¼ tsp salt over the noodles and allow them to sit for 5 minutes over the sink. This will draw out excess water. 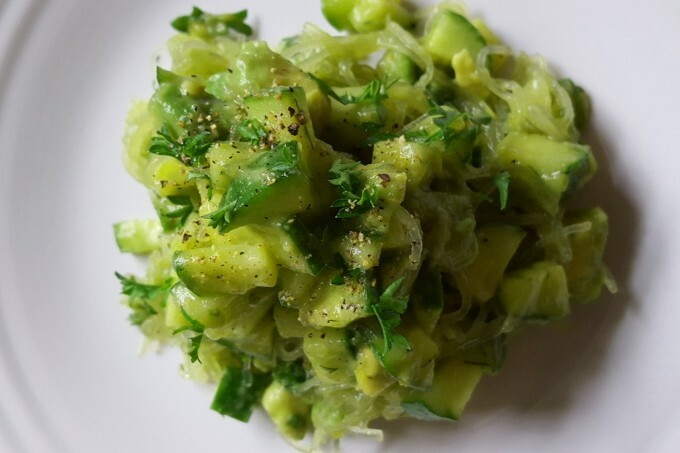 While zucchini sits, make dressing: in a mixing bowl combine lemon zest, juice, a couple pinches salt, coconut, olive oil. 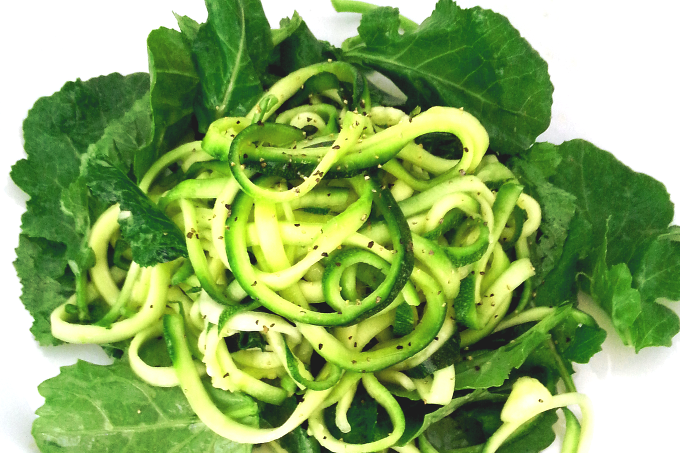 Pick zucchini noodles up out of colander, and place on a plate with some paper towels to help them dry a bit. Dab them with towels to remove excess liquid. Toss noodles in dressing, then add the baby kale, toss to combine. Optional additions can be added at this time as well. Taste for seasoning. You may want to add more lemon or a bit more salt. *If you can't find coconut cream, just buy full fat coconut milk and scoop off some of the creamy part. YOu can also add more if you want to make the dressing creamier. It’s summer and what’s more summery than tomatoes? I was playing around with gazpacho recipes for a personal chef client of mine, and settled on this idea. Sun dried tomatoes lend a deeper layer of flavor to the soup, but you could certainly make this recipe without them. I’m all about simplicity, so this recipe is meant to be easy and approachable. 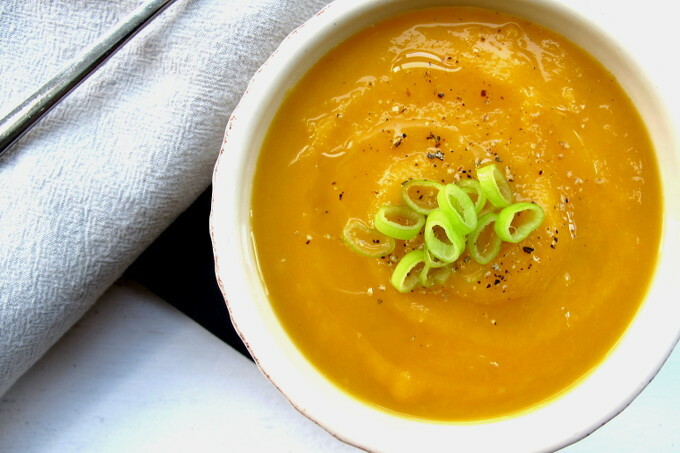 If you feel like getting creative, try adding some melon, maybe some roasted bell peppers……some hot sauce or other herbs…… anything that you feel would be delicious in this tomato based soup! 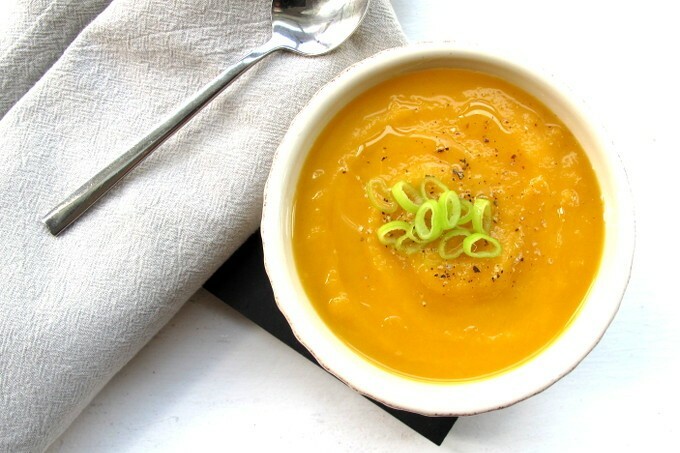 A bright and refreshing simple summer soup. 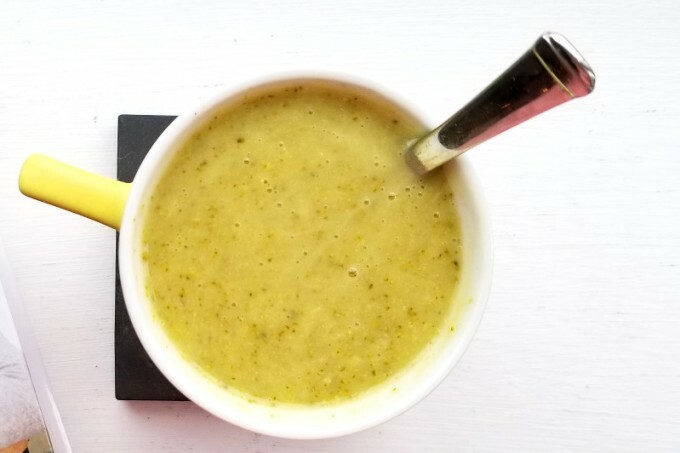 I like to add extra lemon and lime to my gazpacho right before serving to heighten the citrusy notes, but play around and make it your own! Optional Additions: 1 cup fresh melon such as honeydew, a little lemon juice. Reserve 1 cup fresh tomatoes and 1 cup cucumbers for later- set aside. Add remaining ingredients, except for oil, to a blender and puree. 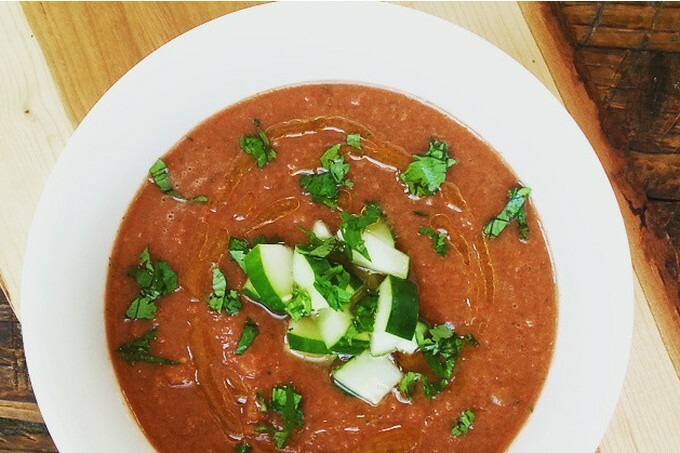 Pour soup into a bowl, add remaing diced tomato and cucumber. Taste for seasoning, you may want more salt or lime juice. Serve drizzled with olive oil and some extra chopped cilantro.